With the cold March there hasn't been much in the way of tweeting outside, but I have gone and created a Slow Water Movement twitter account to compensate for this. I've been resistant to creating a twitter account for a long time, but I've got lots to say about water, so it should be a fun way of sharing neat things I find and info about water. 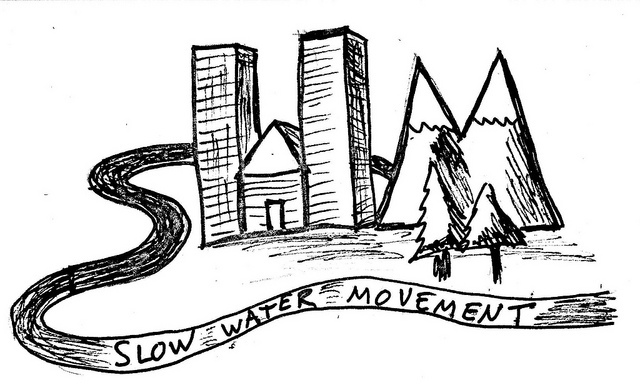 Check it out: http://twitter.com/SlowWaterMvmnt and 'follow' the account for slow water updates. It may be spring, but there is a late winter storm heading for Vermont. 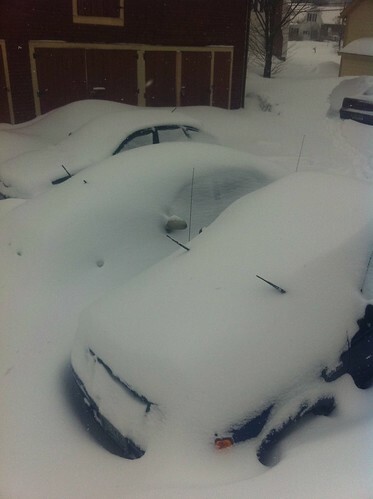 Some forecasts were calling for up to a foot of snow around the state. I think it will be a bit less but a few heavy inches are likely in the Champlain Valley and more in the mountains. It could end up being cold rain in the valleys instead, in which case it may wake up the amphibians. I'll have updates (and 'tweets') soon. As Winter slowly winds down, I am very much looking forward to being able to do more sketching while outside. 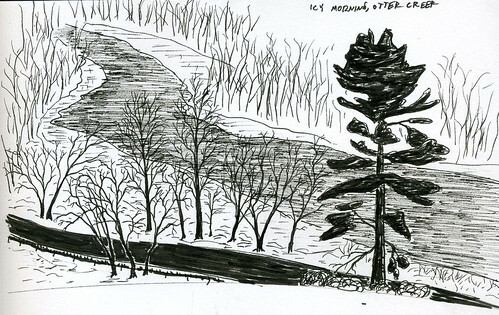 Most of my winter sketches have been created from photos, or while looking out through a window. Since some of my friends enjoyed the other sketches I posted here in the past, I am posting a few more, even though some of them are not directly related to water. This is Otter Creek from Samas Market in Middlebury. This was in the early part of winter, and the open water in the creek was rapidly freezing. Something about early spring in Vermont makes me think of Winter throwing a temper tantrum. The weather has been fluctuating wildly. First, we were blasted by the front I mentioned a few weeks ago, which brought two feet of snow. It's been a bit of a crazy week for me. Crazy, but incredibly fortunate, compared to the people of Japan. Last week I posted about the approach of a cold front to Vermont. This cold front was originally expected to drop a couple inches of snow, then 10 inches of snow as of my post, but instead, there was a major blizzard. Two feet of heavy and wind-driven snow dumped over almost all of Vermont. I was essentially snowed in without Internet for two days, though very cozy and comfortable. The whole state was shut down for a while. After this heavy dumping of snow was cleared away, I made my way out to California to visit family and friends. After I left Vermont, much of the Northeast was pounded by flooding due to heavy rains, in some cases on top of snowpack. My home in Vermont was under evacuation notice due to possible ice jam flooding, but none occurred. While in California, I visited a very neat native plant and wastewater filtration park. I'll have more about this later. Finally, just a short thought about the Japan tsunami. Disasters of this scope are unpredictable, unpreventable, and unstoppable once unleashed. With something of this scope, horrible tragic loss of life and loss of shelter and way of life are inevitable. Japan was as prepared as anyone could be; if they hadn't been, the already horrible death toll would be even higher. It is well known and well documented that healthy wetlands along a coastline and in estuaries can delay and decrease the impact from tsunamis and storm surges. Preservation of wetlands is often looked at as a way to 'save the Earth' and protect endangered species, but in truth it is often the best way to protect endangered PEOPLE from the many water-based disasters our planet is unfortunately so prone to. Every wetland lost along a waterway is not only a lost ecosystem, but lost protection for us and our homes as well. When we remove a wetland we are gambling against the future - betting that floods and tsunamis will not occur. Unfortunately, in the long term, this is a bet against nature that can never. never be won. Whether it is a horrible tsunami in the Pacific Ocean, or a ice jam flood in northern New York State, stochastic events WILL occur and the less buffer we have against them, the more loss of life we will see. And restored or constructed wetlands may not function quite as effectively as naturally occurring wetlands,. but they are still far, far better than nothing. If you don't consider yourself a conservationist, and don't worry much about lost habitat, please still consider the above when a new proposal to drain a wetland comes up. It's not that much of a stretch that you or someone you care about may be put in danger by the very same wetland loss you are deciding whether to oppose now. The LA Creek Freak blog had a good post about this as well, check it out if you would like to read more. Best wishes and warm thoughts to our neighbors in Japan, connected to us in Vermont and the rest of the US much more closely than we realize. May the loss of life be minimal, may the recovery be swift, and may we learn from this so it does not need to happen to this extent ever again. It's been warm for the last two days. The snowpack in Vermont has taken a major hit. For the last 18 hours or so, it's been raining rather hard, and the smaller rivers are raging with rain and snowmelt. Otter Creek is still iced over but I wouldn't be surprised if the ice ripped up and caused some ice jams. At about 10 AM, I noticed that the online weather station was indicating 33 degrees in Middlebury. I was confused because I had just been outside and it was a balmy 48. Was the weather station broken? Nope! Sure enough, it WAS 33 degrees outside! It was POURING, and the rattle of sleet was evident in the rain. A strong early spring cold front was blasting through the area. Two hours later, Burlington is reporting snow and here in Middlebury it is 31 with freezing rain and sleet. There are little beads of frozen raindrops on the branches of the trees, and everything is slowly becoming covered in ice. The ice storm won't last long, because the freezing rain and sleet will soon turn over to snow here also. We could get up to 10 inches of wet snow before the storm is over tomorrow morning. This graph from a wunderground.com weather station is pretty amazing. You can see the temperature dropping 15 degrees in about 10 minutes, the wind shifting from the south to the north, and heavy precipitation. Will Vermont's Icy Winter Break Soon? This has been a cold, long, snowy winter. I love winter and have been enjoying it very much, but I am also looking forward to spring: maple syrup, migrating amphibians, vernal pools, rushing streams, spring ephemeral wildflowers. March is usually a time of cold rains, wet heavy snows, wind, and occasional deceptively warm days. Today we had a snow squall rage through, and now the temperatures are dropping like a rock. It doesn't seem like it now, but signs of spring may be on the way. This weekend, rain is forecast. Not icy freezing rain and sleet like we had earlier this week, but rain - perhaps quite a bit of it, and possibly heavy. There will be snow before the rain, and snow after the rain, but nevertheless, it will probably be quite rainy for a time. When the rain hits all this wet, thick snow, the creeks will immediately rise. If enough water rushes into the rivers, the raging waters will rip off much of the ice that has been encasing them for the last three months. This will result in ice jams, potential flooding, and one of the first signs of spring - the sights and sounds of running water everywhere. This may herald the start of mud season - one of the less popular of Vermont's many seasons. Mud season is a great time to talk about watersheds, because it includes a lot of rushing water. It's a bad time for hiking or driving on dirt roads, though. It is also concurrent with the start of sugaring season and amphibian migration season. Really, I think of mud season as like ripping off a scab. It is an example of wrenching change - painful, powerful, exciting, and cathartic all at the same time. Not that ripping scabs off is necessarily a good idea... but mud season is. Despite all its inconveniences, it is the time water speeds up and comes back to life.